When drinking alcohol, people often mistakenly base the quantity of alcohol consumed on the number of cups they drank. This can lead to over consumption of alcohol. Students who choose to drink alcohol should consider the type and amount of alcohol inside their cup. 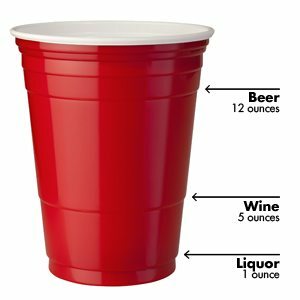 They can use the lines in a red cup (like the one to the left) to help them keep track of the quantity of alcohol they are drinking. The bottom line can be used as a marker for one drink of hard liquor. The second line can be used to measure one drink of wine. The third line can be used to measure one drink of beer. On average, it takes the body approximately one to two hours to eliminate the alcohol in one drink. Most beers or wine coolers are five percent alcohol by volume. Typically, one drink is the equivalent of 12 ounces. Most malt liquor beverages are seven percent alcohol by volume. Typically one drink is the equivalent of eight to nine ounces. Most table wines are 12 percent alcohol by volume. Typically one drink is the equivalent of five ounces. Many liquors are labeled as 80 proof, meaning they are 40 percent alcohol by volume. Typically one drink is the equivalent of 1.5 ounces. *Depending on factors such as the type of spirits and the recipe, one mixed drink can contain from one to three or more standard drinks. Type and number of drinks: See What is a Drink? above. Time: On average, it takes the body approximately one to two hours to eliminate the alcohol in one drink. Body weight and composition: Heavier individuals tend to have more body mass and therefore more blood to diffuse alcohol in their BAC. Gender: Women tend to have more body fat and less body fluid. As a result, they will often experience a higher BAC when drinking the same amount of alcohol as a male. Food: The amount of food in the stomach impacts how quickly alcohol is absorbed into the bloodstream. Food will not change the amount of alcohol that enters the bloodstream, but it will slow down the rate of absorption. Students who are not sure whether or not to call for help should use P.U.B.S. Student who see even one sign of alcohol overdose should call 911.